FLABO collection • JELÍNEK - výroba nábytku s.r.o. Treat yourself with a quality you can rely on. Wake up from "sleep in the clouds"
FLABO collection was made in cooperation with German designer Jochen Flack. The designer has selected solid oak, 40 and 25 mm thick, for this luxurious bedroom. 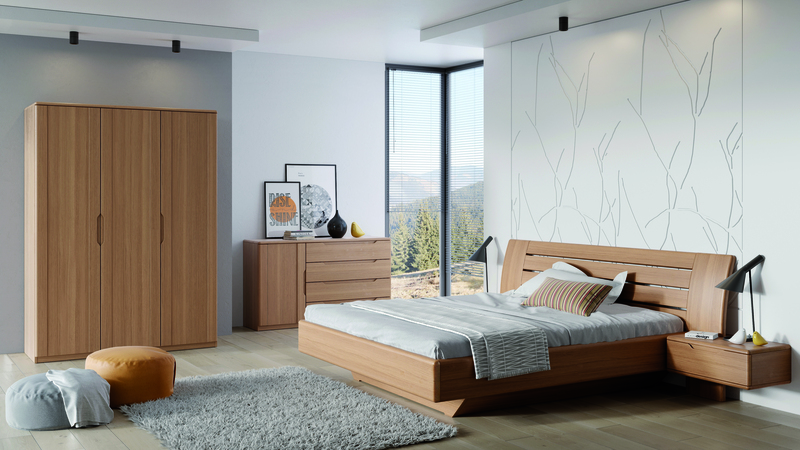 The strong, solid oak is lightened with distinctively receded base and the whole bed, including ingeniously fixed nightstands, gives an impression of levitation and floating in space. There is no better place to recharge your energy than a bedroom from solid wood. We believe that the design and perfect sophistication of natural OAK will amaze you. Thanks to round edges of the furniture and precise manual sanding, it is a pleasure to sit on your bed in the evening or get out of it in the morning. Moreover, you don’t have to worry you’ll trip over the bed foot thanks to the receded base. The nightstand FLABO is embedded in the rounded headboard. A drawer offers generous storage space. Solid oak wood can have a surface finish made with wood stain (varnished surface) or natural oil (without varnish). Stain and oil hues can be selected from our sampler, or we can mix a hue according to your wish and your sample. We know that cleanness of a bed is very important and that is why you can choose a fabric for upholstered headboard from MYSTIC and ASTORIA sampler. These fabrics have the so-called Aquaclean finish and can be cleaned easily. The sampler is available in our stores. Day begins and ends in a bed. FLABO bedroom will provide you the necessary comfort and luxury. The rounded headboard with shaped upholstery literary invites you to laze in the bed. You will not want to leave this place that makes you feel like “in the clouds”. We can respond to your requests flexibly. FLABO bed can be made to your wish in several variations and size models. FLABO bed can be ordered with or without nightstands. Skillful engineers preserved a drawer with a full slide and pneumatic shock absorbers. If you like to lounge in your bedroom all day and you don’t want the bedding to be seen, you can order a storage space for your FLABO bed. More information on accessories and prices of the collection are available in the price list or you can contact us via this form. We will be happy to inform you where this collection is displayed. Are you interested in, what it looks like? Come to visit us. We will be glad to show you our factory.